Summer is well upon us and the sites look lovely. In part this is because a lot of people are working hard to make them so! In particular, the Forum meeting on May 12th agreed that the programme of regular Wednesday working parties will continue. Simon Braidman and Sue Kabel have put a lot of work into this programme, which means that anyone interested in working on a nature reserve can simply turn up at 10:30 AM at the Stanmore Common car park on a Wednesday; from there they will walk or take cars to the work site, usually Stanmore Common, Stanmore Country Park, Wood Farm or Bentley Priory, but sometimes further afield - Roxbourne Rough or Newton Farm. The summer jobs have been varied: recently they have been scything meadows in Stanmore Common, bramble bashing on Bentley Priory, and digging up goats rue on Wood Farm. Yes, we are indeed working on Wood Farm - Harry Lines, the volunteer warden, supervised the working parties on May 6th and June 3rd. Jaysam, the developers of the housing estate, allowed us to use the visitor centre, which we have equipped with a kettle and cups. However, the site is not formally open to the public nor ours to manage yet. As I understand it two things have to happen. First, the “attenuation tank” (which stores rainwater and treated sewage from the housing estate and releases it slowly to the pond) needs to be moved into the area of the housing estate itself. This was ongoing when we worked on site on June 3rd and should be completed by mid June. Second, the Council and the developer have to agree a “Deed of Easement” allowing the discharge of treated sewage and rain water into the pond on Wood Farm. It is this agreement that should define how the sewage treatment system is maintained and how the management company interacts with the Greater Stanmore Country Park Management Committee. I have emphasized to Tony Donetti at the Council that we (which in this case means the Greater Stanmore Country Park Management Committee) need to review and agree the wording. This is a make or break test of the concept behind the Greater Stanmore Country Park Management Committee, that is, a full collaboration between the volunteer wardens, councillors and Council officials. A collaboration that does work very well is the Green Grid, now in its (I think) fourth year. This funds capital projects that improve open spaces and the walking routes that lead to them, with the aim of increasing health and happiness in Harrow by encouraging exercise and contact with nature. The notable projects on our sites in 2014-2015 were the creation of a good quality path from the Roxbourne Park car park to the western entrance of Roxbourne Rough, and the building of two bridges over a stream on the way from Stanmore Country Park to Scouts Field and on to Pear Wood. As an aside, this stream does not have a name - I’m suggesting “Red Brook” because it is usually coloured red from rust leaking from the landfill under Wood Farm. There are two projects that will improve our sites in 2015-2016. Firstly, a complete refurbishment of the Bentley Priory Circular Walk, including new signage throughout and a boardwalk at the infamous mire at the Aylmer Drive entrance to Bentley Priory. Secondly, improvement of paths at a number of locations in Stanmore Country Park and Wood Farm. I’m conscious writing this that the works in both 2014-2015 and 2015-2016 represent improvements for people, not wildlife. This need not be the case: in 2012-2013 the Green Grid funded clearance of young trees to link two areas of acid grassland in Stanmore Country Park, improving the site for grassland invertebrates, while in 2013-2014 it funded works to stabilize and improve the old orchard at Grimsdyke. It’s up to us to think of capital works that will improve our sites for wildlife and propose these for Green Grid funding. On May 12th our Forum meeting was addressed by Amy Scoville-Weaver, a Masters student at the London School of Economics. She is conducting research on the Green Belt and the ongoing debate on whether areas of it should be opened for housing development. She wants to interview Harrow residents, so if you’d like to contribute, contact her at A.L.Scoville-Weaver@lse.ac.uk. I have suggested to her that the results should not languish in the LSE library but should be sent to the Campaign for Rural England to help them fight development in the Green Belt. Newton Farm Ecology Park is the southernmost of our reserves and one of the smallest. It certainly has potential - it has a permanent pond with a dipping platform and its location next door to the Shaw Trust horticulture training site opens up possibilities for collaboration (and access to toilets for visiting schoolchildren). The Home Group, which built the large housing development between Rayners Lane and the elevated Piccadilly Line, supports our work on the site and provides both meeting rooms and a place to store tools. Simon Thomas, the volunteer warden, does sterling work in clearing rubbish and bringing schoolchildren on to the site. However the site does not enjoy good support from the local community, whose main contribution is to drop trash of all shapes and sizes. Building up a local friends group who can look out for and cherish the site as well as helping the warden is a high priority. Over the past year a grant from the Big Lottery Fund to the Home Group has paid for a number of training days on the site as well as working parties that have planted some flowers along the edge of the old Healing Garden. The indefatigable Russell Sutcliffe has been involved in some of this work. The Big Lottery Funded project is culminating in a “celebration day” - basically a fair - on the site on July 4th 2015. By coincidence, Simon Braidman will be leading a guided walk through this site and Roxbourne Rough on the day - meeting at Rayners Lane station at 10:330AM - so join him then stop off at the fair to see the stands. The hope is that we can interest some local residents enough to put their names down to form the core of a Friends group to support Simon and Russell in their work on the site. To my considerable surprise Harrow Council has announced a small grants programme for 2015-2016. It does not cover the whole financial year - we are already in June! - and offers a reduced amount, a maximum of 4000 GBP rather than 5000 GBP, but it would be worth getting all the same. As in previous years the majority of the requested money would go on reprinting leaflets and TCV days. However we are also going to request a day’s training in scythe use and maintenance, to be held at Newton Farm. 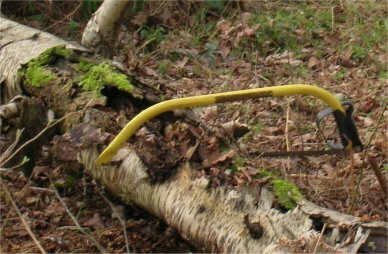 This will both continue the program of events there and hopefully interest local residents, and teach those of us who use scythes in the bigger sites how to maintain them including the mysteries of “Peening”! Lastly the nature trail at Stanmore Common - it still doesn’t exist! The bollards are in place, and I have the roundels, but I need to create a first draft of the leaflet. Hopefully the Harrow Council small grant will be the last bit of “very urgent - must do first” paperwork and I can spend some time on the leaflet. Rev James Mercer reported that after many years Betty Brown has stood down and will now take the role of treasurer and Jane Skelly will take over as secretary and assistant warden. South of the pond small trees have been thinned. The bees in the churchyard have over wintered well and have been seen taking water from the pond. The butterfly meadow has been cleared so it does not scrub over. On the western side the building work on the Harrow College site will be noticeable particularly in the winter. The Forest School is in its third year and has got funding for 3 more years benefitting young people and families. More leaflets are needed and Steve will supply them (using funds from the Harrow Small Grant). Jill reported that the Churchyard has been looking lovely. The Primroses have been a real sight. There have also been Bugle and Wood Anemones amongst other flowers. Peter Peretti reported that this year will see the end of the Heritage Lottery Fund project and a Finale Celebration is planned for 23rd June (details have been circulated). The site is full of flowers. Peter highlighted some of the major projects that have been carried out over the years on the site. Camilla gave an update on the situation regarding the Princess Alexandra Home and the land adjacent to Bentley Priory. Sue Kabel reported that they had an estimate for 30 head of Long Horn cattle to graze the site (just under £5000). The removal of the mound will be carried out by the contractors on site. Steve reported that he is leading two groups of cub scouts from the 1st Stanmore Scouts Group, based on Marsh Lane, Stanmore, around Bentley Priory tomorrow and then again on 18th May. Steve reported that he met with Simon Thomas, Paul Brogan, Mark Patterson, Russell Sutcliffe (assistant warden) at the Beacon centre on 5th May. We agreed to put on an end of year "celebration" at which we would try and collect names to form a ‘friends’ group. Provisionally this is timetabled for 4th July. HNCF would do a ‘pond creatures’ display and also a before and after display showing images of the site before it was converted into a park, and now. Paul will organize a leaf hunt using materials from the Woodland Trust. Mark Patterson has been organising regular working parties including volunteers from Pop-up Harrow and ourselves. Claire reported that all the bird boxes with the exception of the owl box which had not been used. They had all been used and we recorded the contents. One had been occupied by tree bumblebees (Bombus hypnorum) which we are very pleased about. We relocated two boxes as they had proved too inaccessible. The fence along Wood Lane has been repaired. Two rotten sections had come down due to high. This is an ongoing job and we managed to repair it this time without new materials but it is getting increasing difficult with no funding. I had requested £10 for metal brackets. Thank you to Peter Elton for his help with this. We have been doing a great deal of work in the old orchard in PW. Traditional old orchards are BAP priority habitats nationwide and we have had a couple of heritage orchard groups come to see ours. The Urban Orchard Project arranged a corporate volunteer work day but it fell through and so we arranged our own. A lot of ivy was removed that had completely smothered some apple trees and caused others to fall over due to the sheer weight of it. We have also created paths, sown wild flower seeds collected from other parts of the wood and done some other jobs. Surveying of species there will be ongoing. We intend to do some careful pruning next winter. A giant bird table appeared. Over several weeks we left notes on it asking whoever had put it there to please get in touch and let me know what they are doing. It was finally moved and hidden. A new path has been created leading from the fishermen’s track to The Scrape. The remaining part in Wood Farm will now be completed. The TCV visit to carry out work on the Dyke on 26th Jan was well attended with 9 volunteers. The toad population has suddenly crashed and there was no frogspawn at all this year. There have been a lot of rats recently and they may have contributed to the problem. It was agreed that the best way to deal with them was to try to locate the actual nests. The question of purchasing roofing felt to make refuges for snakes was discussed. It was noted that currently the HNCF has no uncommitted funds. The issue of rough sleepers was discussed. As well as contacting appropriate Council Officers (details will be circulated) Rev James Mercer explained that Julian Saunders, Manager of the homeless charity Firm Foundation, could be contacted for advice or a visit if necessary on 020 8426 5515. The question of spending some of the Wood Farm section 106 money on the 10 Acre Field was raised as this was what the Greater Stanmore Country Park Management Committee wished to do. There was no money available from the Neighbourhood Investment Scheme to provide a gate for access. Cllr Keith Ferry pointed out that the 10 Acre Field was handed over to the Council two to three years ago and thus the Wood Farm section 106 was not relevant. The Council has a Parks Maintenance Fund which should be used to provide a gate etc. The matter will be raised at the meeting with Council Officers on the 13th May. Dave Bolton reported work has continued clearing ditches and litter. The wind has meant that there has been quite a bit of fallen timber to clear and the grass cut of the path borders has been carried out for the first time this year. A Wednesday working party carried out clearance work on the site and they were thanked for this. More tadpoles have been taken from the pond and only a few remain. The good news is that work has been carried out on laying the path from the car park to nature reserve. Also volunteers are arriving via “Pop-Up Harrow”. The single gate next to the five bar gate is now open and there have not been any problems. Dave again expressed concern about the safety of the exit opening out on to the road at the top of the steps. A gate, opening inwards, is needed at the foot of the steps and it has been agreed that this will be installed. John Winter is now officially an assistant warden for the site. Simon reported that 20 hours of work have been carried out on Bluebell Heath and Steve now has the Roundels to generate the information leaflet for the nature trail. 588 hours of work have been carried out over the rest of the site. Work has including clearance work around Greater Brewers Pond, clearing carefully to get more light in. A bank has been cleared at New Heath. A lot of work has been carried out controlling Holly. Work has been done to benefit a Wild Service Tree and a Spindle (some seedlings of the latter and layering offshoots will be relocated). Also some of the excess young trees and shrubs from the Glenthorne planting have been introduced (keeping a note of where they have been planted for recording purposes). The Acid grassland is also looking good and an old Hawthorne where clearance work has taken place is flowering well. At least six Guided walks have taken place including a Moss walk on the 31st Jan and a bat walk/survey on 8th May. A spider walk with Edward Milner is planned to start at 10.30 am on 20th June. Regarding the Grove ponds Steve reported that he spoke to Mr Clifford on the 14th Jan and he said that he intended to clean out the western pond himself, removing the tractor tyre etc. He did not want any input from Simon's team. He was also interested in the horse ride. Simon clarified that users of the ride would need to employ a Hydrology expert at their own expense before major improvements could take place. Maya Dodwell has resigned so the warden team of the east was now looking after the whole site. Maria Crastus is now a Deputy Warden for Public outreach for Stanmore Country Park. She is thanked for the work that she has done in producing articles highlighting the area. Steve reported that Mark Richardson had been contacted with regard to a complaint about shooting sounds coming from the Country Park. We have not had incidents reported to us recently and there has been a lot of noise associated with adjacent building works. Any evidence of shooting activity should be reported to us and the police. Steve will reply to the concerned individual. As Cllr. Anderson suggested, we are now recording loose dog incidents to the Council. Cllr Perry contacted Mick Wynne and he promised to send a Council representative to ‘have a quiet word’ with the main culprit; a professional dog walker. The dog walker was not impressed The first butterfly of the year, was found by Simon Braidman whilst cutting bramble on January 14th. Marian also found a 7 spot ladybird. Work has been done to clear a bramble patch and saplings near Ant City. Also all the birch stumps from the BTCV clearance two years ago in Upper Blue Pond Field have been dealt with the help of Steve Bolsover. Blocking trees were also removed by Steve and Sue Kable. April We are now winding down on large working parties for the summer. Margaret and I found the pipe that is the main source of Cloisters Brook. However surface water is also coming from the Temple enclosure above it and a wooden bridge has been erected to cross it previous to the temple taking over that site. It would be useful to find out the real source of this water. We have arranged to meet and inspect the source of this water in the Temple grounds. The public car park is now open for 24 hours but will be shut once a month at 4.30pm as the sign says. Thanks to Steve for this. We are also investigating the ditch at the edge of Seven Acre Field. Seven Acre seems to have become wetter since the Green Grid work was done. We have also been coppicing some of the willows in 6 acre Field with the help of Steve Bolsover. Recently the fire brigade has been called out to dowse a fire in a stack of logos in Upper Blue Pond. The recent moth evening went well but the attendees got too cold for comfort. A list is available. On the Bluebell and Butterfly walk, we were joined by Malcolm Hull, the new chairman of our local Butterfly Conservation branch. Many thanks go to all the volunteers that help us out; Maria, Simon and Sue particularly and Marian and Norman. Peter Elton with his ‘machine’ has been invaluable. Peter is also submitting a monthly bird report for the whole Greater Stanmore Country Park area to the London Bird Report. The Broad-leaved Pondweed and the NZ Parrot’s Feather were removed from Spring Pond by Harrow Council contractors. The Pondweed has returned but not the Parrot’s Feather (not yet Ed.). The pond weed is native to this country but the Parrot’s Feather is an invader. Mark Richardson of the Parks Dept. came to look at the gap created by the contractors when removing the weed Into this gap some builder’s waste has subsequently been dumped. The rubble has now been removed and the tree trunks replaced. A working Party has taken place to pull out Goat’s Rue.